Girl Kuripot Girl Kuripot: Philippines in Pixels, Win a Trip to Kuala Lumpur, Davao or Kalibo! Philippines in Pixels, Win a Trip to Kuala Lumpur, Davao or Kalibo! This is a chance to win flights from Clark and stays from Travel 3 Sixty - 3D2N in Kuala Lumpur or overnight stays in Davao or Boracay! Just be a member of AirAsia.com. Submit your pictures (max 2MB) of any landmark in the Philippines with a creative caption and your contact details through the Submit Photo page. You have until November 25, 2012 11:59 p.m.! Have you tried AirAsia and Air Asia X? Check out my AirAsia trip to Japan! 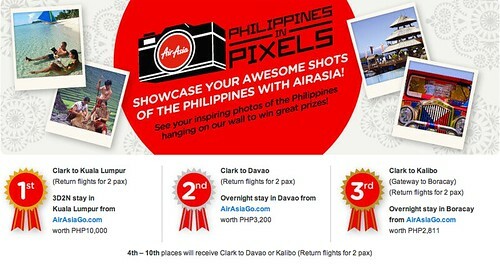 Click here for more info on AirAsia's Philippines in Pixels Contest.